In 1994, author Paul Bishop released the first novel in a series featuring Fey Croaker, an LAPD detective like no other. 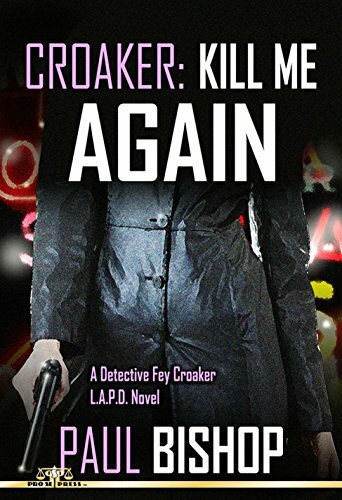 Pro Se Productions is proud to announce that the first Croaker novel, KILL ME AGAIN, is available in a special print and digital edition and also contains a new short story by Bishop based on his own career as an LAPD police officer. With the unit she leads facing a run of unsolved cases, Los Angeles homicide detective Fey Croaker is under intense pressure to solve the murder of a woman with multiple IDs, a million dollars in cash hidden in her dryer, and only brand new clothing and furniture in her brand new condo. When fingerprints inexplicably reveal the mystery woman was murdered eighteen years earlier in San Francisco, Fey feels her career crashing down around her. Complications in the twisted case compound when investigation reveals the woman's husband—the man convicted of killing her the first time—was released on parole only weeks before she was killed again. However, the victim has many more surprises for everyone involved—especially for Fey, who finds herself a suspect when the investigation takes a turn for the deadly. Featuring an atmopsheric cover by Keith Birdsong and cover design and print formatting by Antonino Lo Iacono, CROAKER: KILL ME AGAIN is available now at Amazon at https://www.amazon.com/Croaker-Kill-Again-Paul-Bishop/dp/1535093498/ref=sr_1_3?ie=UTF8&qid=1468001394&sr=8-3&keywords=croaker+kill+me+again and Pro Se’s own store at www.prose-press.com for 15.00. This special edition of the first Croaker novel is also available as an Ebook, designed and formatted by Lo Iacono for only $2.99 for the Kindle at https://www.amazon.com/Croaker-Kill-Again-Paul-Bishop-ebook/dp/B01HZXQIH8/ref=sr_1_1?ie=UTF8&qid=1468000514&sr=8-1&keywords=croaker+kill+me+again and for most digital formats via Smashwords at https://www.smashwords.com/books/view/648319. Four previously published Fey Croaker novels will be published over the next year by Pro Se Productions. Plans are also in the works for Bishop to pen a new Fey Croaker novel as well as there to be a Croaker anthology featuring other writers’ takes on Fey. THE SOUND OF ADVENTURE! ‘THE PEREGRINE OMNIBUS ONE’ NOW AVAILABLE IN AUDIO!